An unusual scheme to turn saltwater to fresh… who said anything about $250 gold?… B-Dud speaks, market tanks… and more! “Global Stocks Drift as Investors Edgy of Yellen Comments,” says a headline at the CBS News website. Listening to Yellen talk, it’s impossible not to be reminded of the adults talking off-screen in the animated Peanuts cartoons. According to the website Mental Floss, that mwah-wah-wah sound effect is made by a trombone outfitted with a toilet plunger affixed to the instrument’s bell. Only in Yellen’s case, the mwah-wah-wah acquires a Brooklyn accent. “Yellen, who has said the Fed is on track to raise rates this year, did not comment on the rate hike timing or the U.S. economy,” says a Reuters account of the speech. Have no fear, though: No fewer than four other Fed governors and regional bank presidents are giving speeches during trading hours today, affording Wall Street’s amateur Kremlinologists no shortage of opportunities to divine the Fed’s intentions. But wait: Wasn’t a rate increase in December a done deal after the job numbers last Friday? That’s what conventional wisdom says. Here at The 5, we’ve taken the other side of that trade in recent days. And this morning, Jim Rickards joins us with his latest insight. “I had a fascinating encounter in the Hong Kong airport recently,” says Jim. “An American businessman approached me while we were both waiting in the departure area. “Turns out he was a subscriber to Jim Rickards’ Strategic Intelligence and recognized me from my TV interviews and publications. This happened just a week after the Aug. 10 shock devaluation of the yuan by China. “He said he had lived in China for over 20 years. He ran a shoe factory there along with his wife and family. There, he made sneakers for some of the discount chains in the U.S. like T.J.Maxx and Wal-Mart. Crude has tumbled below $42, a level last seen during the market swoon in August. Helping push the price down is the latest inventory report from the Energy Department; inventories are now approaching a peak last seen during the second quarter. “There is no good way out for the Fed,” says Jim. 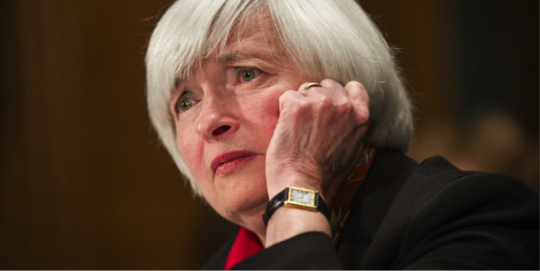 “Janet Yellen’s conundrum just got worse. The strong October employment report makes a rate hike more likely. The prospect of a rate hike makes the dollar stronger. A strong dollar is deflationary. But the Fed wants inflation, not deflation. “None of this adds up for Yellen. If the Fed raises rates, they will cause the kind of deflation and economic slowing they’re trying to avoid. In other words, Janet Yellen has talked herself into a corner. And so the next jobs report — due Friday, Dec. 4 — becomes crucial. It will be the last one before the Fed’s next meeting in mid-December. At this time, Jim won’t rule out a rate increase, notwithstanding his big call a year ago — no increase during 2015 — that’s withstood every test so far. “If the November employment report is even modestly strong, or stronger, the Fed will almost certainly raise rates in December, notwithstanding other signs of weakness. “In this scenario, the dollar will go through the roof. Deflation in commodity prices (including oil and gold) will resume with a vengeance. The Chinese will almost certainly have to devalue the yuan again. On the other hand, “If the November employment report is weak, the Fed may once again blink and not raise rates,” Jim says. “At that point, the Fed’s credibility will be in the shredder. “The dollar may not get stronger, but it may not weaken much either because the Fed will continue to “talk tough” on rate hikes (without actually doing anything), as they have for the past 2½ years. Under either scenario, there’s one sure loser… and Jim’s proprietary IMPACT system has revealed a trade with the potential to triple your money. Subscribers to Currency Wars Alert got the recommendation on Tuesday. It’s not too late to get in. For access, look here. Just in: The International Monetary Fund has given Janet Yellen an out if she wants to leave rates alone. An IMF paper prepared for the next meeting of G-20 countries this weekend says the Fed should wait for more signs of inflation. As traders try to suss out the meaning of every Fed speech today, the major U.S. stock indexes are skidding some more. At last check, the S&P 500 is down two-thirds of a percent, at 2,061. That’s a not-insignificant climb down from 2,100 at the end of last week. Bonds are benefiting a bit from the flight to safety. The 10-year Treasury yield has backed off to 2.32%. You haven’t heard of the term? You’ve likely heard of certain platform companies, though — the drugmaker Allergan, Anheuser-Busch InBev, Kraft Heinz. They are the reincarnation of the 1960s conglomerates, says Chris Mayer: “Conglomerates are corporations given to diversifying their businesses by acquiring other businesses in other lines of work.” The names back then included Gulf & Western, ITT, Textron. The year 1968 brought a huge merger-and-acquisition boom — with three times the number of deals as any year that came before. But all manias come to an end, and so it went for the conglomerates. “Saul Steinberg’s Leasco might be the poster child of the movement. The stock soared 5,495% in the four years 1966-1970. Then it tried to buy Chemical Bank, a $9 billion institution. That was the top. And so it goes now for the platform company. Chris tells of an enlightening talk at the recent Grant’s Fall Investment Conference by James Litinsky, founder of JHL Capital Group. Litinsky drew a direct line from the conglomerates of old to the platform companies of today. “The poster child of the 2.0 boom is Mike Pearson’s Valeant. The pharma company thrived by buying up drugs and companies using mostly debt. In fact, Pearson’s Valeant did $43.1 billion worth of deals. It paid for all that by borrowing $32.2 billion in debt. “The stock, as with Leasco, came out of nowhere. It generated a return of 3,452% from 2008–2015. But Pearson could not solve the problem of the 1960s conglomerates. He hit the same wall.” By last month, Valeant shares had crashed 58% from its all-time high set in August. “Speaking of liquid gold, water,” writes one of our regulars after yesterday’s Overtime briefing from Jim Rickards, “When I lived in Quebec, Premier (think governor in the U.S.) Robert Bourassa proposed putting a causeway/dike across the mouth of James Bay, which is a lobe off Hudson Bay at the southeast end. “There are absolutely massive rivers — from which a lot of American electricity comes — that feed into this, and slowly that bay would become fresh water, which could then be piped to a thirsty U.S.
“Byron King said yesterday, ‘Any way you look at it, the long-term forecast for gold is up,” a reader writes. “But the other guy is saying gold will drop to $250.00. You guys are my go-to gurus, so I suspect you will be right. If I could buy a ton, I would want him to be right, though. The 5: We’re not sure what “other guy” you refer to. We know of one fellow in the newsletter world calling for $700. We’re always amused when we see pitches for his service on the website of a certain bullion dealer! P.S. “If GDP and inflation are still below the Fed’s targets,” a frustrated reader writes, “then why do the morons at the Fed keep threatening hikes every other day or week? And with that, the Dow is down 200 points on the day and the S&P is back in the red for the year! The fact is we can’t do anything about it. So you might as well try to make some money from it.